I first talked about my desire to see red and white versions of the absolutely movable crossing gates, as talked about in this post http://www.bachmanntrains.com/home-usa/board/index.php/topic,30692.msg226445.html#msg226445 I will talk more about those and also talk about other Bachmann crossing related matters. I have three pairs of these signals (and plan to buy one more pair) but two of them came with orange lights. These were the best crossing signals I've ever seen, owned, and used, it's just too bad they are out of production but it would be nice if they were brought back and exactly as they were before, same plastic, same material, same crossbuck, same STOP ON RED SIGNAL sign, and though this is the 21st century, incandescent lights, although I know they're not as energy efficient as L.E.D.s. I wonder why these signals went out of production in the first place. Was it because "better" crossing signals came out (like NJ International's signals, Tomar Inudstries Signals, etc.) But I'd buy one more pair of these if only they were in production again. They can be found on eBay but you have to be really fortunate to come across these and you have to be really, really fortunate to win the bid on these (or purchase them as "Buy it Now." If these did come back, they'd likely be lit with L.E.D.s instead of incandescent bulbs because L.E.D.s are more efficient and save on energy and don't burn out as quickly (well can if not handled with care, I know from experience and had several L.E.D. lit signals burn out on me, that's why I generally prefer bulb-lit signals over L.E.D. signals.) They'd also be lit with L.E.D.s for technical purposes and because we live in the L.E.D. age, or are getting deeper into it. But I'd rather use incandescent lights, they're more classic that way and they fade in and fade out, usually. In addition to seeing red and white versions of these, what I'd also like to see is someone attempting to put lights, namely L.E.D.s on these crossing gates to make them more realistic, whether black and white striped or red and white striped (I like crossing gates having working red lights on them as practiced for real in the USA, Canada, Netherlands, and Australia to name a few places. It can be done, now I'd like to see if anyone has tried it and would like to see pictures of a Bachmann crossing gate retro-fitted with gate-arm lights. I don't expect Bachmann to make gates with working lights on them. 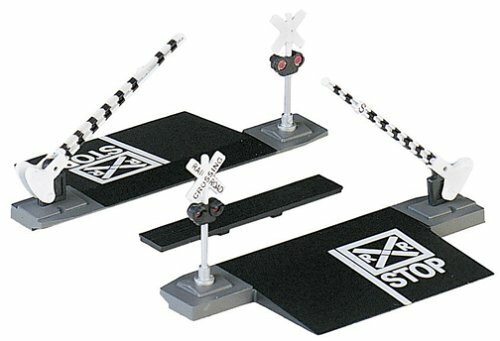 which can be found on this page http://www.ebay.com/itm/Lighted-Flashing-LED-HO-Bachmann-Crossing-Signals-Circuit-Board-Free-Gates-/331332524943. Now what would be even cooler is if someone made the gates light up with the signals, having two of the gate lights flash alternately with the signals and the third light at the tip of the gate solid. I'd like to see that even on Bachmann's black and white movable gates, and, if they come out or if someone makes or modifies them, red and white versions of those gates. I've seen pictures of crossing gates with L.E.D. lights added to them, including NJ International's gates, which have fake lights but the fake lights were removed to by the model railroader to make way for the real lights. Click this link to see an NJ International crossing gate with L.E.D.s added to it https://i.ytimg.com/vi/yHkUpmoC-9s/maxresdefault.jpg I'd have embedded the image but it's too big to put on this thread so I put in a URL instead. And I believe this can be done on any crossing gate regardless of the manufacturer. However, the one with the house, there was a time when they came with flashing signal lights and a bell, which would be hidden in the house. However, the bell made more than just a bell sound, it also made a louder accompanying sound like a drill or motor running and the bell had a very high-pitch sound that wasn't realistic. Plus the lights did not flash alternately, in fact each crossbuck signal had one light bulb you stick into the back hole of the signals and when activated by the triggers you put under the track, the lights would light up and flash, but making the lights look as if they're flashing simultaneously instead of alternately and the lights would flash super fast, or more like "flicker." A better way to make those crossing signals work, if a model railroader wanted to, he could take out the fake lenses on the signals and replace them with L.E.D.s, and I've seen someone do that, or at least read of a person doing so. 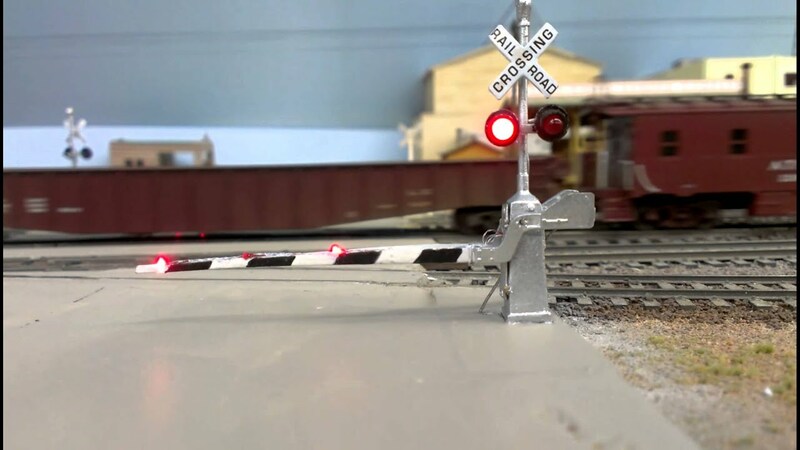 This is a great way to make the Bachmann crossing signals flash alternately, of course the modeler would need a flasher unit and perhaps a detection unit. For more realism, a modeler could also remove the fake lights from the gate arms and put smaller L.E.D.s on the gates, whether all of them closer to the tip of the gate or futher apart and more all-over the gate. To flash the gates, you would probably want to use surface-mount L.E.D.s or whatever L.E.D.s you'd like to use. I don't know how you would implement a bell sound though, that you'd have to figure out yourself. 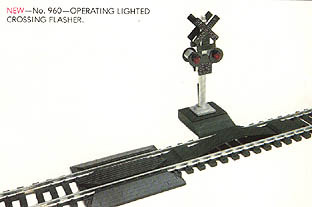 I don't expect Bachmann to make lighted crossing signals or lighted crossing gates, the model railroader would have to retrofit the signals and gates with lights him or herself, which would have to be purchased separately. Do these sound like great ideas? If any of you do this, or will do this some time in the future, would you please provide photos of these. Or if you see a photo or video of these before I do, please show me, whether by embedding or by URL. 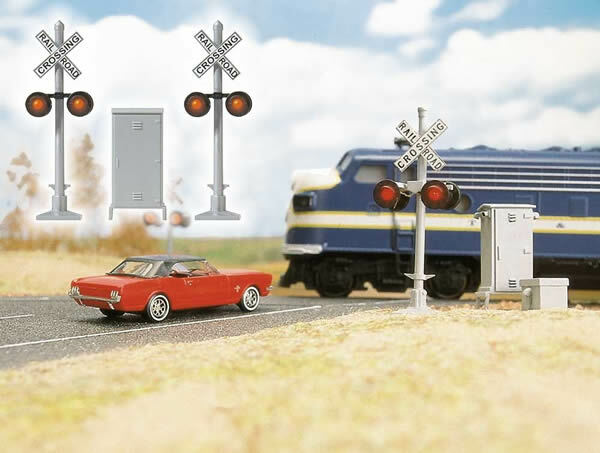 Plus, do not forget, Bachmann's movable non-operating gates can also be used with signals from other manufacturers like Busch and Model Power, or Model Rectifier Corporation (MRC) or any signal you like to use. (Note, please do not show me pictures posted on Photo Bucket, RR Pictures, Rail Pictures.net, Facebook, or any videos from Google, Youtube, or Vimeo, for psychological reasons, I would strongly prefer not to see or have even the littlest to do with those websites. Shutter stock and FlickR are two okay websites, but anything but the ones on my off limits list please,) thank you. Thank you in advance and thank you for reading this and my other post. Just some ideas I thought I'd toss out that maybe you'd like to try for your Bachmann crossing gates and crossing signals. Oh yes, that "dual crossing gates with flashing lights and bell" from the 80s and 90s was SO cheesy. In fact, in the early 80s, Bachmann's arch rival TYCO made a slightly better version that used a single gateless crossing signal on the base, with a loading dock next to the signal. Inside the loading dock was a mechanical clockwork-operated bell that would be activated by the pressure of the train (similar to the crossing gate), and you would wind up the mechanism with a knob hidden underneath a crate. As the bell would ding, it would hit contacts that would cause the crossing lights to flash on and off. They would alternate, but they would do it rather fast, and again, the bell was rather high-pitched, but at least it didn't have an annoying motor noise. Still a lot more realistic anyways, and a much improved crossing than Bachmann's attempt. I am actually thinking of modifying my TYCO crossing gate with LEDs in the signal, hooked up to a crossing signal controller. If I build a new layout in the future using E-Z Track, I will probably use the E-Z Track crossing gate and modify that as well with LED flashers. I do think it'd be a good idea if Bachmann made realistic scale-model flashing crossing signals, though! I'm so happy someone finally responded to one of my posts! I know it's an old post and I've been gone for so long but I came back today (because I was Googling HO crossing signals) and clicked on an image that led me back to this page, and I saw your reply. Mind you, I don't really like to use forums all that much, I'm socially awkward and not very interactive, but I am making this one exception. These are cool and interesting signals! One of them is more humble than the other though and I think the "more humble" signal looks more like it could be used for pedestrian and bicycle crossings considering how short the grade crossing is! I like the way the signals look, that they flash (otherwise what's the point?) and they have black crossbucks with white letters, I find that cool too although I do like the white crossbucks with black letters as still done today on real crossings. It's kind of interesting that the signals have double-crossbucks in addition to bi-directional warning lights. 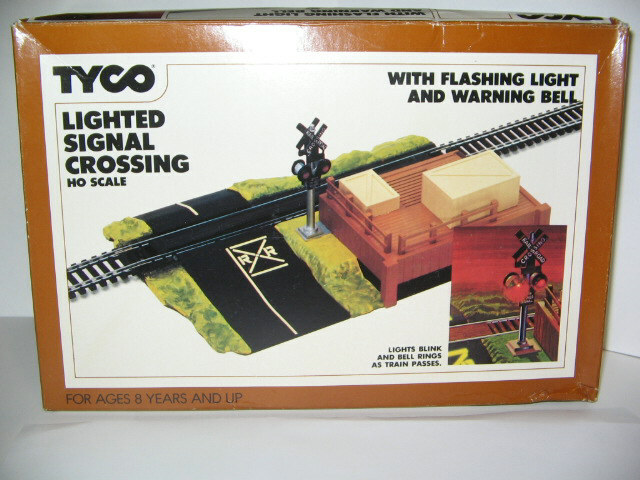 Now it would have been better if Tyco also made their crossing gate with lighted signals, even if the lights only faced one direction. 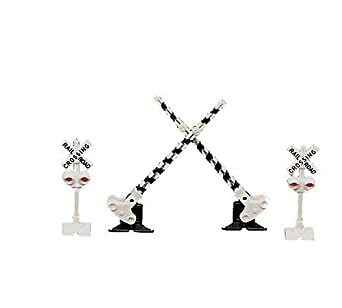 I wonder what it would have been like if they put two signals per crossing (dual signal crossings) and two gates like Bachmann and Lifelike do, and I do own some Bachmann and Life-Like Dual crossing gates but I hardly use them and have been long thinking of selling them, probably won't by the looks of things. I do have a few photos I took of Life-Like crossing gate signals with Bachmann crossing gates on them! I took out the Life-Like black and yellow gates and put the Bachmann black and white gates on them and they look a little more like the Tyco crossing gates, only this time they're in Dual-Crossing gate form, although I also did it in single-crossing gate. Then I took off one of the Bachmann gates and returned one of the Life-Like gates for comparison, two Life-Like signals on Life-Like crossing platforms, one with a Life-like gate and the other with a Bachmann gate. I'll show them on a later day. What the Tyco Crossing signals and Life-Like crossing signals have in common other than their lack of functional lights are their black crossbucks, or inverted color crossbucks! 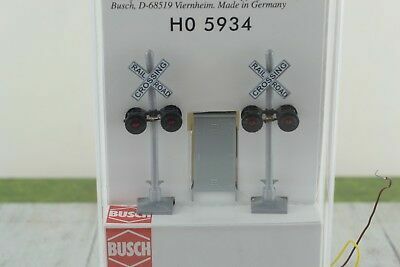 About the Busch crossing signals, those first of all are the first HO scale operating crossing signals I ever owned. And what I like about these is that they already come with L.E.D.s and a flasher unit so no need to order separately and wait longer to buy one then the other (signals then flasher unit.) The lights flash quite fast (like 2 flashes per light per second) but that's okay, and at least they don't come with an annoying bell (they don't come with any bells at all as a matter of fact!) It does scare me that the signals are so small and fragile and can be crunched very easily if stepped on, so I put them back in their packages when I'm not using them, but at least they're more convenient and they were some of the least expensive signals. I got my first five pairs from Whole Sale Trains and they used to sell for less than 20 dollars! Not anymore unfortunately! What's also unfortunate, I just found out Whole Sale Trains went out of business https://www.trainorders.com/discussion/read.php?3,4104428 It happens! But these are one of the best HO scale crossing signals for me to own! 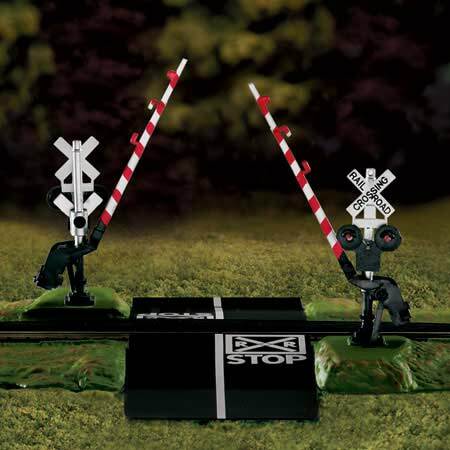 And they can be used with NJ International or even Bachmann non-operating crossing gates. By "NJ International crossing gates" I mean the ones that don't come with crossbucks (1170-1173) which I also own. I recommend the use of Busch US Style crossing signals, especially if you want signals that come with flasher units, but be careful with them if you ever do use them! They are very fragile and need extra care! 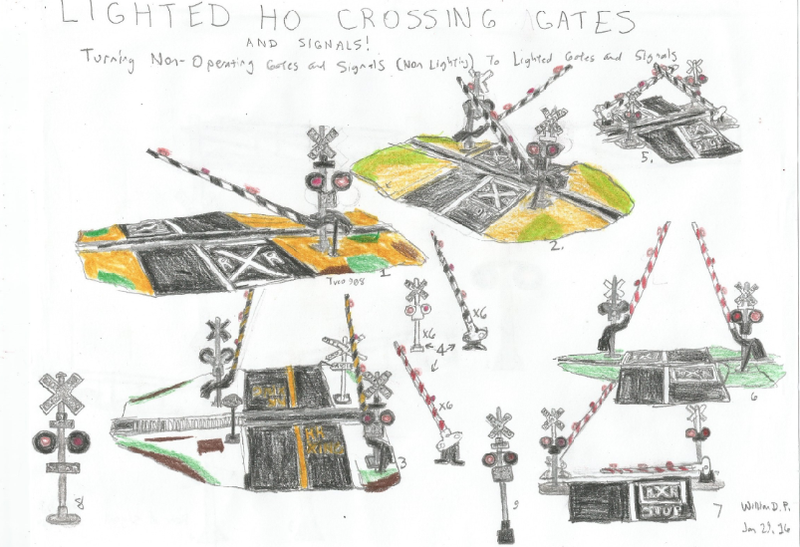 Before I go, I also have a Deviant Art account if you're interested https://www.deviantart.com/willm3luvtrains I have lots of train pictures, including this drawing I did of non-operating crossing signals upgraded to light with L.E.D.s and something I'd like to see done for real! https://www.deviantart.com/willm3luvtrains/art/Lighted-Non-Operating-Crossing-Gates-and-Signals-587579878 Yep, not to brag but that's my drawing. If you use Deviant Art too and if you want you can watch me there too. Thanks again for responding to my post and for reading and for your time!